T. S. Poetry Press, 9781943120123, 150pp. Is it possible to teach someone how to write a poem? Or does poetry simply "come from the heart" or from a special talent only some can ever hope to have? Of course there's no formula for writing an amazing poem. If poems came with instructions like IKEA(R) coffee tables, we'd all be missing the point. But this book will give you some strategies-some tools, if you will-to assemble your personal, imaginative raw materials into poems that will surprise and intrigue. These strategies are focused primarily on free verse, yet many of the concepts can also be applied to form poetry, at both the inception and revision stages. 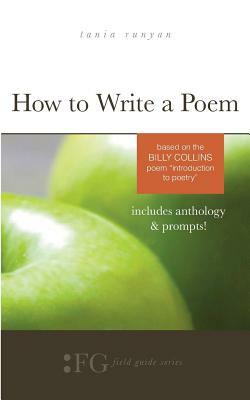 How to Write a Poem uses images like the buzz, the switch, the wave-from the Billy Collins poem "Introduction to Poetry"-to guide writers into new ways of writing poems. Excellent teaching tool. Anthology and prompts included. Tania Runyan is the author of the well-loved How to Read a Poem: Based on the Billy Collins Poem "Introduction to Poetry;" has served as an editor for Every Day Poems; and is the author of four books of poetry, including A Thousand Vessels and Simple Weight. Her poems have appeared in many publications, including Poetry, Atlanta Review, Nimrod, and Southern Poetry Review. She received an NEA Literature fellowship in 2011.